The author learns something about pace while living off the land. 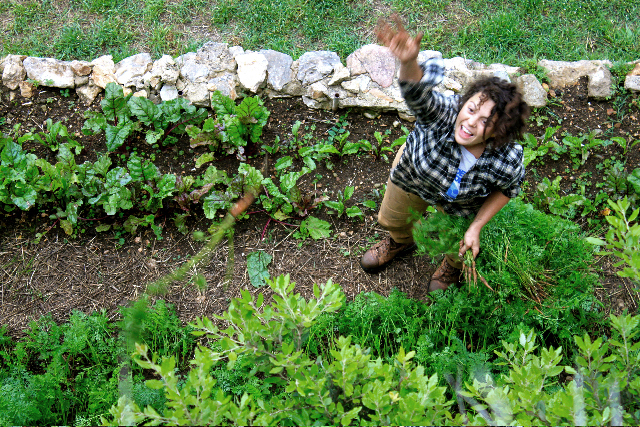 Cully Eisner-Terrill tosses a carrot from l’orto, the vegetable garden. From what I am told the average person puts on about 15 pounds while at Spannocchia. I’ve heard as many as 24 from first person accounts, but I’d be willing to wager the record is in the 30s. The trick is not caring. My fellow interns and I turned it into a running joke (pun intended). We would kid that they were fattening us for slaughter. We identified our own bodies with the anatomy of the pigs we cared for. “My lardo is coming along nicely.” Proscuitto legs, jowls, you get the idea. I came to Tuscany for many reasons, but chiefly because I wanted to experience Italy through the lens of its food culture — from its farms and chefs to its artisans and winemakers. In my four months here I relished a taste — OK, more than a taste — of the quintessential Italian food experience, plus something unexpected and perhaps even more valuable: an education in what it means to live sustainably beyond the food on one’s plate. Pizzaiolo Angelo Parini fires up a pie. I had just finished my first full growing season as an apprentice at a farm on Long Island’s East End when I decided to embark on a trip abroad. 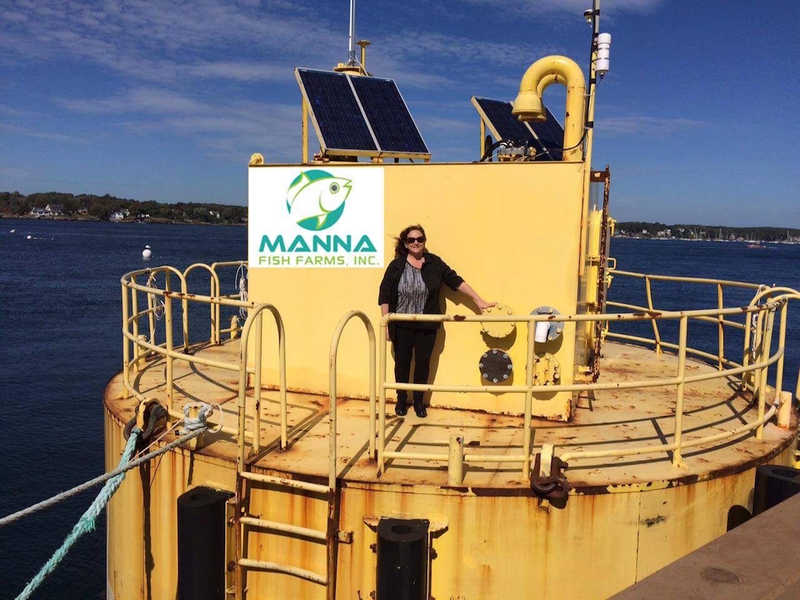 I had worked at an egg-producing farm in Nassau County, an organic vegetable farm in Suffolk County and as the manager of a farmers market in Queens County, and I was eager to learn more about how the rest of the world does food and agriculture. So with one semester of long-forgotten Italian under my belt, I ventured off and immersed myself in the Italian food and farming community. I would come to learn that kale, ubiquitous on the Long Island’s East End, is also everywhere in Tuscany. Lacinato, or tuscan kale as it is known in the U.S., goes by the moniker cavalo nero, or black cabbage. Early on I made the faux pas of asking for cavallo nero, black horse. Maybe in Northern Italy or Sardinia, but not here. Tuscans like their horses alive! My journey began with a Google search: “Sustainable Farms in Italy.” The first hit was the Spannocchia Foundation. I clicked on it and discovered a 1,100-acre organic farm set in a wildlife reserve on ancient Etruscan land. I then learned the farm was nearly self-sustaining and produced an extensive list of fruits and vegetables, several renowned meats, various grains and three types of wine and olive oil; I was sold. After submitting a comprehensive application and going through a round of interviews, I was awarded one of the eight slots for the spring season. 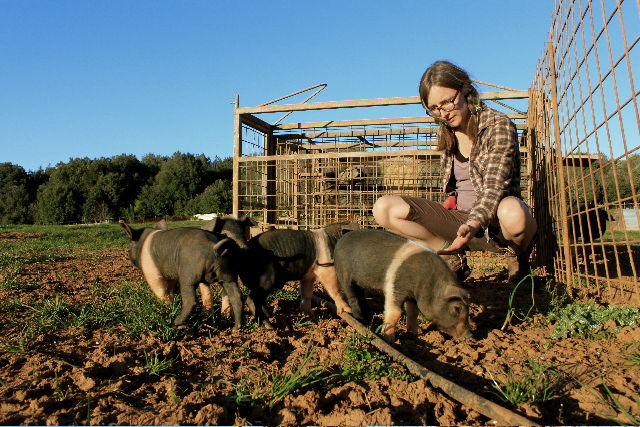 Animali Suzette Turner feeding the maialini (piglets). The oldest known records date the tenuta (agricultural estate) to the late-12th century, and since then it has by in large been farmed under the mezzadria system, in which many families — up to 40 at its peak — lived on the farm and split their crop production down the middle with the landowning family. After the Second World War and Italy’s subsequent conversion from monarchy to democracy — and the ensuing economic boom — the door opened for the peasant class to ascend the societal rungs. By the mid-1970s the Italian countryside had been transformed. Fortunately there are people dedicated to paying tribute to the history of the region (and the importance of peasant culture) by practicing traditional agriculture. 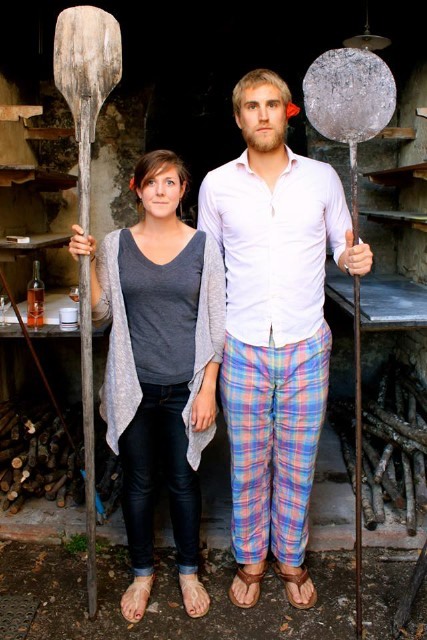 Operating under the principle of parsimony, the owners of Spannocchia, Randall Stratton and Francesca Cinelli, have endeavored to change as little as possible by being a living museum to demonstrate how one can keep customs while remaining with (and sometimes ahead of) the times. It’s not uncommon for owners to hide solar panels on a secluded rooftop mere meters from a medieval tower that cannot be altered due to Italian rules on historical preservation. The internship program is crucial to looking toward the future while nodding to the past. Steven Waldman nurtures the newborn calf. Each spring, summer and fall, eight interns (international, but predominantly American) arrive at Spannocchia to learn about Italian food, culture, language and sustainable agriculture. Randall, Francesca and the rest of the staff introduce each new cohort to work and life at Spannocchia, a line that — unlike in the U.S. — often blurs. Interns are placed into one of three specializations, orto, animali or tuttofare. 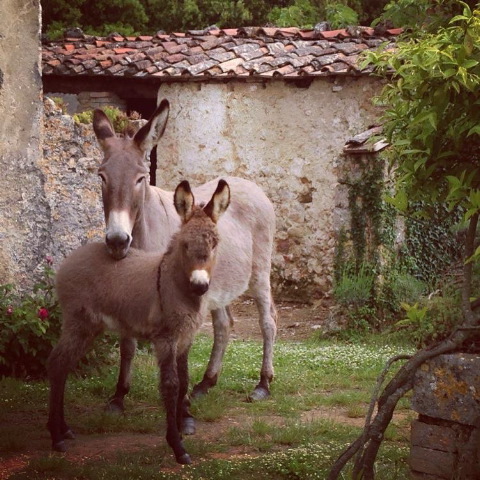 Orto care for the vegetable garden, animali the animals, and tuttofare “do everything.” Aside from these tasks, interns are intermediaries between the farm and guests, serve dinners in the villa and act as ambassadors for Spannocchia and its sustainability initiatives. “The beauty of Spannocchia is that the program is a microcosm for selflessness and sustainability,” says (now) former education director Katie Phelan. Interns rarely taste the fruit of their labor, but get to enjoy the work of their predecessors; they are also responsible for the next group — a laudatory continuity in an age when generations battle over the future of dwindling resources. 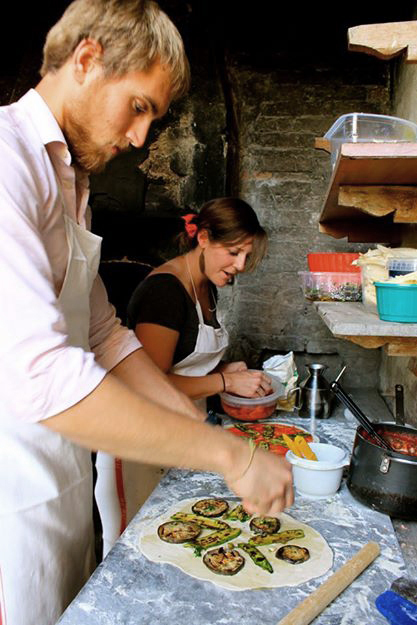 Patrick Ronald and Susanna McKibbon decorate the pizzas with farm fresh toppings. Yet here resources do not feel scarce. There’s the abundant terraced orto and the four-course meals prepared by head chef Graziella, a rosy, petite woman who looks straight out of medieval Italy (and was in fact born and raised at Spannocchia under the mezzadria system), and her sidekick Pietrina, an equally petite jovial and jestful Sardinian. The lack of scarcity is due to the prevailing mantra of sustainability. Of course, if you take care of the earth, it will take care of you; however, I am constantly reminded of that here: The farm vehicles run on natural gas, efficient diesel and electric power, and an intricate wastewater recycling system uses plant matter and a series of ponds to convert wastewater into water suitable for irrigating the fruit orchard. My job at Spannocchia, tuttofare, primarily included caring for olive trees and the vineyards. But I was also responsible for maintaining the heating system for the entire complex via the caldaia­, a super efficient wood-burning furnace that captures gases and thus 90 percent of the potential energy. This is much better than a fireplace, which loses most of the heat through the chimney. The wood is harvested on-site under the coppice cutting system — which stimulates growth — in traditional 20-year cycles and is aged three years. In the U.S., common practice leaves one seed tree per acre. At Spannocchia one is left every 20 feet. Gateway to the Italian countryside. Sustainability education is mandatory for interns and suggested for guests and groups visiting the property. 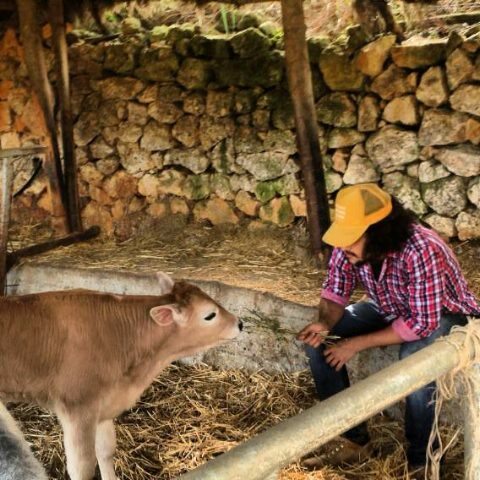 Tours include the history of Spannocchia and Tuscan peasant culture or the cinta senese pig, a staple of the region and by far the most important animal on the farm. In 1983 there were fewer than 100 of these pigs left in all of Italy. Today there are nearly 200 at Spannocchia; other local farms also raise them. In addition to the pigs, 14 chianina cattle and three monte amiata donkeys live on the farm; both were threatened species. In 1994 Spannocchia landed a grant to implement a Noah’s Ark project, to preserve native species. Unlike the pigs and the cattle, which are used for meat, the donkeys, which have no use on a farm today, are kept solely for conservation. The significance of the animals permeates life on the farm. Anything that can be used for “slop” (pig food) is. Grains and legumes grown for animal feed are planted in rotation to sustain the health of the soil, and the animals are pastured under the principles of rotational grazing. When pigs and cattle are butchered, no parts are wasted. In my first few weeks at Spannocchia, I ate pig brain cooked several ways (including a delectable crostini with leeks), fried strips of pig ears, trotter (feet) salumi, kidney and testicles. A memorable meal was the time the macellaio (butcher) Riccio brought fresh “head cheese,” the primary ingredient in soprresatta, from a pig slaughtered that morning for the interns’ lunch. 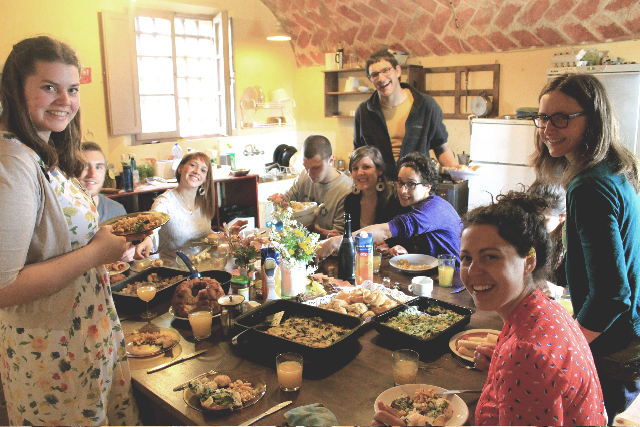 Pulcinelli, the intern house, hosts Easter brunch. Each Wednesday evening regular dinner became nostra cena­, a family-style meal with extra courses and after-dinner café and digestivo. Every once and awhile these dinners were pizza nights, magical experiences where the wood-fired oven offered some of the best pizza I’ve come across. Tasks rotated among the interns include firemaster, pizza maker, runner and server. As a tuttofare well versed in the types of wood on the property and adept at starting fires, my favorite task was firemaster. A fire must be built slowly, methodically; I’d start at 3 p.m., so the maiden pie would enter the oven at 7:30 p.m. The technique requires progressively adding wood and spreading the embers towards the edges of the oven to heat the stone evenly. Once the first round of pizza went in, I was relieved of my duty could sit with the guests and eat. 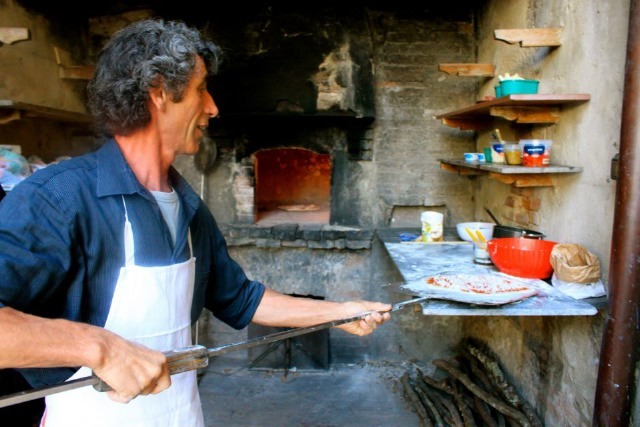 After an ungodly amount of pizza was eaten, several interns used the oven’s residual heat to make bread for the next day’s meals, a community oven practice once a mainstay of Italian culture. 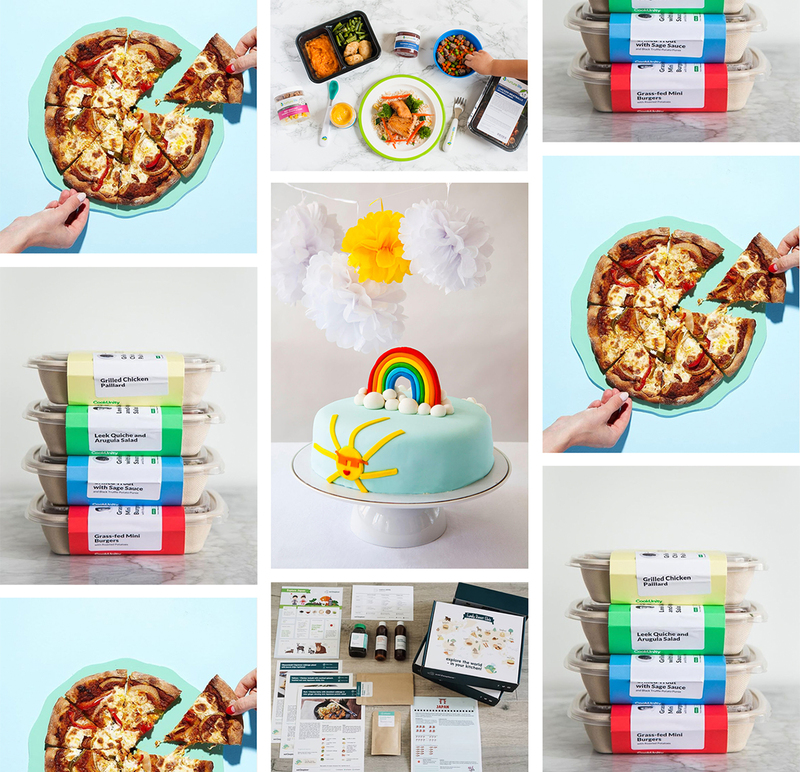 Before my internship, I would have never considered regularly binging on seemingly endless feasts on the weekend or taking two-hours lunches on workdays. In fact, on one of my favorite days, we started at the farmers market, sat down to a three-hour seafood lunch, which was followed by a three-hour birthday dinner featuring chingiale (wild boar) that the birthday boy had hunted and prepared. All in all I spent upwards of seven hours that day among friends enjoying delectable food and even better company. I’ve never been so satiated in my life. Mount Amiata donkeys, Serena and Stefano. A highlight was a foraging lesson. After spending a good part of the morning identifying and sampling more than a dozen leaves and flowers we had been walking by for weeks, we harvested, prepared and gorged on a meal that included wild fennel, calendula flowers, borage, shepherd’s purse, dandelion, elderberry, lemon balm and wild mint. Included was the lesson of letting nature run its course to maintain native plants. A biodiverse property is better than a uniform lawn for the entire ecosystem, from the microbes in the soil to the free-roaming donkeys that share the edible plants with us. It’s this kind of food for thought — or should I say thought for food — that makes the Italian food experience starkly different from the one I knew. While we look to weight loss pills, dietary fads, and “experts” to tell us what to eat, Italians look no further than culinary traditions. In Italy, a large part of the population grows food. As my bus brought me from the airport to Rome’s city center, I saw verdant terraces overflowing with potted herbs and vegetable plants. Outside the big city, I saw innumerable plots of land, most no bigger than 20 feet by 20 feet, growing enough food to support a family. 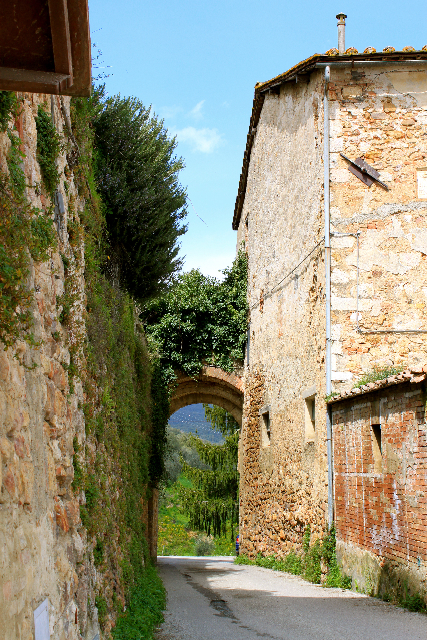 It’s easy to see why Carlo Petrini’s Slow Food movement was born here. Italian Gothic, Susanna McKibbon and Patrick Ronald. There exists a palpable and contagious sentiment at Spannocchia, and throughout the Italy I saw, that things should be done slowly with great care and thought, as opposed to the haphazard ends-justify-the-means attitude so pervasive elsewhere. What my experience in Italy has taught me is that by placing greater emphasis on the process and worrying less about the outcome, the outcome is improved. As a young person evolving in America’s hyper-frenetic FOMO (fear of missing out) society, my time in Italy forced to reassess my values. As I pruned olive trees and tied grapevines, I thought back to my time in New York, where I jetted from place to place because I believed every second counted and it was a shame to “waste time.” Now I think that should make me slow down, not speed up. At Spannocchia my supervisor, Angelo, constantly reminded me “piano, piano” meaning “slowly, slowly.” It’s a difficult habit to break, but I am learning.